It has been a revealing couple of weeks. 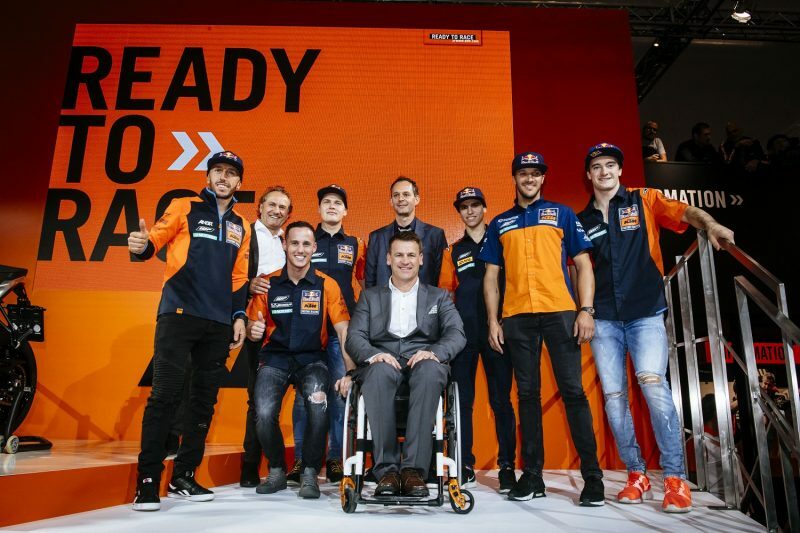 First KTM showed off the second generation of the FREERIDE E-XC (that takes pride of place at EICMA as well) and then moved from the expanses of Hangar-7 to the cavernous halls of the Fiera to tickle more fancy among journalists, fans and motorcyclists from across Europe. 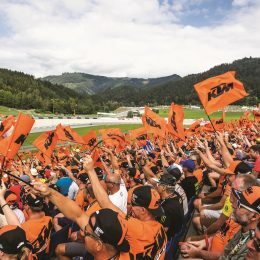 A strong nod was made to the latest clutch of FIM World Championship titles – MXGP, Supercross, Enduro and yet another Dakar crown – as well as an emphatic entry to MotoGPTM this year with the final round in Valencia hot on the heels of the first flashes of life around the display plinths in Milan. Otherwise the mechanical ‘stars’ were very much orientated around the new LC8c engine and the clutch of 790 machinery that plugs the gap in a wallet-teasing range of street and offroad wares. 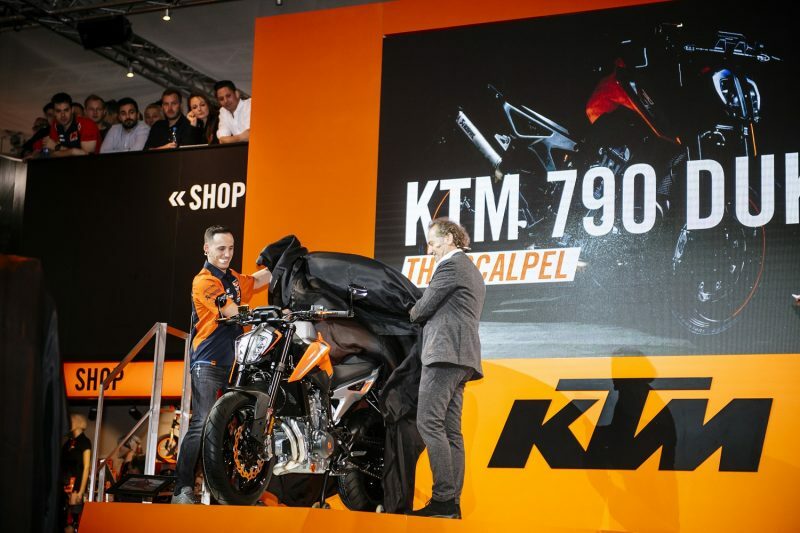 The form and design of the production KTM 790 DUKE – The Scalpel – was shown for the first time after previously existing in prototype guise and whet the appetite. As KTM’s first multi cylinder model in the segment, the KTM 790 DUKE has been granted the goal of ‘combining real-world practicality with maximum street performance’. 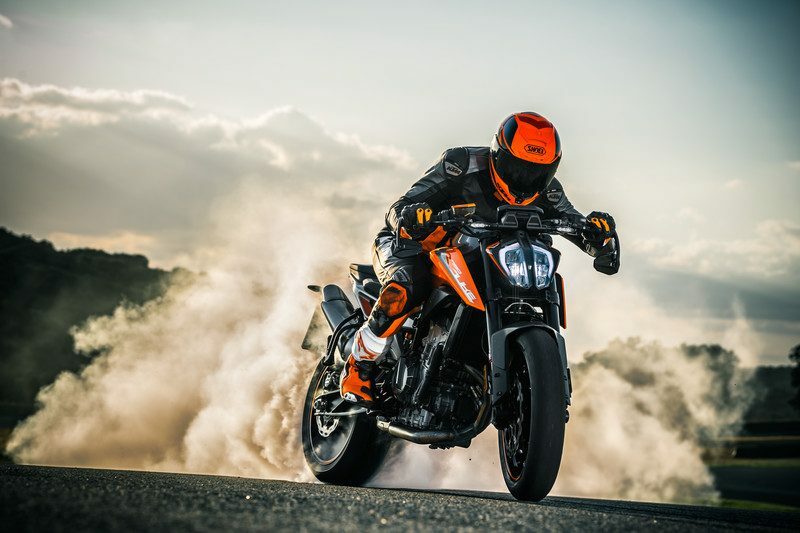 And KTM seem to hit the nail on the head by stating that 790’s edge over the single KTM 690 DUKE and the sumptuous KTM 1290 SUPER DUKE R is through attributes such as low weight, great agility and precision are often more important for riding enjoyment than maximum straight-line acceleration on those gorgeous twisty roads of this world. 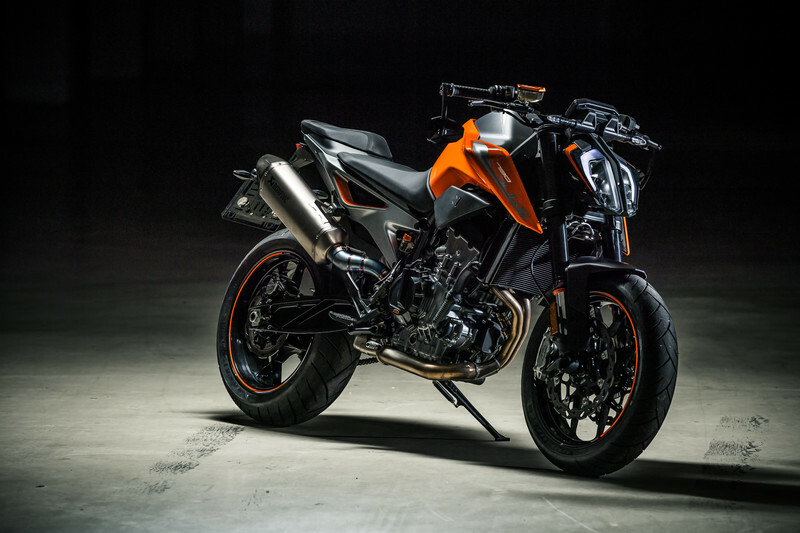 In its final production dress the KTM 790 DUKE offers 105hp and 86Nm of torque and it is immediately noticeable how compact and light the motorcycle actually is. The 790 has a distinctive DUKE profile but is also very ‘2018’ with the optimized geometry, latest suspension kit from WP and electronics such as motorcycle traction control, motor slip regulation, launch control, quickshifter + and new ‘TRACK’ riding mode. The KTM 790 DUKE is again another shape-shifter from Mattighofen. Some will see a striking and fun commuter, others a naked bike to dwarf any sports machine out on country lanes and the plentiful tech spec sheet will allow The Scalpel to slice open more than a few rivals on the racetrack. Turning heads was the prototype KTM 790 ADVENTURE R – a curious (potentially new) look and an addition to the ADVENTURE family – which complements the 1290 and 1090 versions by hovering an elbow in the mid-range market. The LC8c engine comes to the fore again. 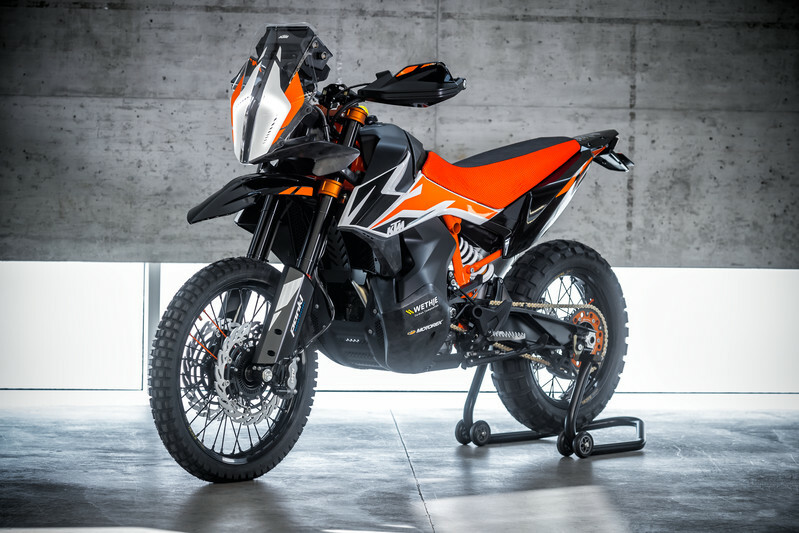 Like the KTM 790 DUKE the power-to-weight ratio is the big bonus here for offroaders and the KTM 790 ADVENTURE R prototype has its place between the KTM 690 ENDURO offering and its bigger brothers. The rally bike shape is a giveaway for the performance it could bring and the promise of a comprehensive rider assistance systems. Some of the interest and evaluation at EICMA could determine KTM’s future direction with this proposal. With good reason the KTM 450 RALLY is a desirable option for any rider with aspirations of tackling rough terrain fast. Along with motocross and enduro there is perhaps no other motorcycle in KTM’s portfolio that has such a strong and direct link with utter success. 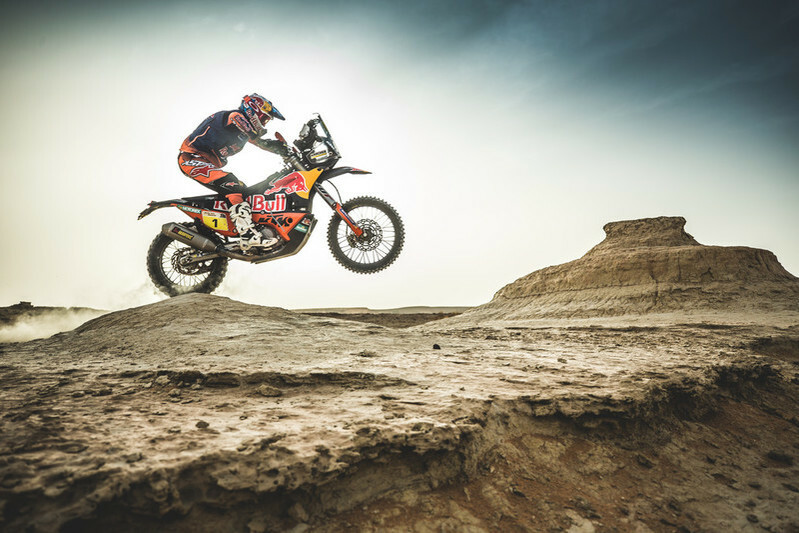 The Rally Dakar has been ‘orange’ since 2001 and through a small variety of motorcycles the 450cc capacity has been in place since 2011 and for the last years KTM have offered a customer racing replica of their victorious technology. The latest incarnate has increased engine power, a new engine management system and transmission, throttle body, air filter box and re-organizing of the steering head area permits more room and centralization. A new chassis, swingarm and seat are just some of the other elements on a standout showpiece. Alongside the KTM FREERIDE E-XC was the more conventional but no less impressive KTM FREERIDE 250 F; a motorcycle that gains an easy to handle and extremely usable 4-stroke powerplant and maintains an important position as the ultimate entry port for riders looking to dabble in some knobbly-tired activity. 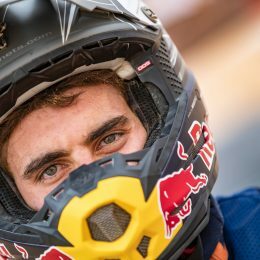 EICMA – as with any other motorcycle show – is like a ‘Red Bull’ for bikers: an energizing and encouraging (not to mention tempting) latest taster of the industry, what’s on offer and what ideas and innovations are coming up. It’s that time of the year to ‘open a can’, get excited and dream of Christmas presents. I would love to know where someone in the USA could buy a 450 Rally Replica?! Call me nuts (knowings it’s probably double the price of a normal 450) but THATS the bike I want! The Husqvarna Nuda 900 came out almost a decade ago and I absolutely loved that engine. Parallel twin Rotax which Husky tuned to 105hp & 100nm of torque. The rest of the bike was a bit disappointing and heavy. When KTM bought Husqvarna I dreamed of a better bike with that engine. Obviously KTM wouldn’t use a BMW engine. Only 86 NM and 169 kg dry = 190 kg or more fully fuelled. Yes it’s 790 Not 900cc but it’s also supposed to be a brand new state of the art engine not a tuned old Rotax. Loving that 790 adventure. That would have my name written all over it if it made to the USA. @Oli have the same feeling. Currently for me there is no point to change my Duke R 690 to 790. 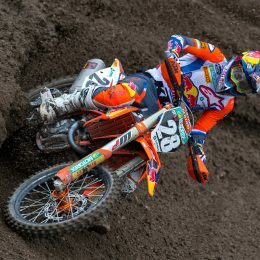 @KTM Not adjustable front/rear suspension in this class is misunderstanding. Where is 790 R version? I want to love the 790 Duke but feel there has been over-promise and under-delivery. To be competitive the specs I was hoping to see was 158kg dry, 112hp, 90nm that would have been a great contender for best middleweight. “Lightness thats off the scales” sure is great marketing. 100 % agree with you Olis, these are definitely points to keep in mind. But where the KTM would still win over the market would be the astonishing price point. Especially for us in India since its production will be set up here.